A derelict cinema bombed during World War Two that campaigners hope to turn into a blitz memorial has been taken into public ownership. The National Picture Theatre, on Beverley Road, Hull is Grade II listed but has been unused for more than 75 years after it was reduced to ruins. Hull city Council said the building was of "national significance". The money to stabilise the ruins and then renovate the site, bombed in 1941, has yet to be raised. The cinema was hit during a raid when more than 150 people were in the cinema but no-one was killed or seriously injured. 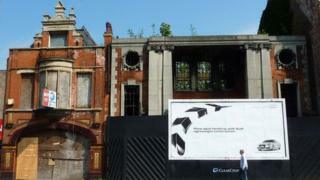 The frontage of the building, built in 1914, remains but the end where the screen was situated has been blown away. Campaigners want to restore the building in memory of the civilians killed during the heavy bombing of Hull that lasted almost five years. They would like to see a memorial area and an educational facility about Hull's blitz within the ruins. The Historic England listing said "there is poignancy in the site as a whole". Image caption The owner's original plans were to develop the site but the council was "determined to save it", it said. Hilary Byers, from the National Civilian WW2 Memorial Trust, said: "It's been a long haul but we are now here on the starting blocks. "It's special character is that it has a large amount of the original building still on it.". The trust has fought a long-running campaign to redevelop the site. Ms Byers said at least £125,000 would be needed just to make the building safe. The acquisition was agreed after deciding to proceed with a compulsory purchase order although ultimately a land-swap agreement was agreed, said the council. Hull suffered its first daylight raid in June 1940 and its last attack was in March 1945. The majority of bombing raids on the city took place during 1940 and 1941.